AGAPIUS (AGAPITUS), succeeding St. Gaudentius (22nd January) as Bishop of Novara in Piedmont, St. Agapius served as the second bishop of that See for thirty years, from 417 until his repose 447. AUBERT, elected eleventh Bishop of Avranches in Normandy by popular acclaim circa 690, St. Aubert served that See until his repose circa 709. While bishop St. Aubert founded the Abbey of Mont Saint-Michel. BARYPSABAS, a first century hermit from the East, who according to legend brought to Europe, a vessel containing the precious blood which flowed from the side of our Lord when He was on the Cross. St. Barypsabas suffered martyrdom, possibly in Dalmatia. CANDIDA THE YOUNGER, a holy woman in Naples who sanctified herself as a wife and as a mother. St. Candida reposed circa 586, and many miracles are reputed to have occurred at her tomb. FINIAN (FINDBARR, WINNIN), St. Finian was a legendary mediaeval Irishman, though perhaps not as well-known as his namesake at Clonard. He travelled to Scotland where he spent time at St. Ninian’s (26th August) monastery in Strathclyde. St. Finian later returned to his native land where he became the founding Abbot-Bishop of Movilla (Magh Bile), Co. Down, not to be confused with Moville in Co. Donegal. According to widely accepted tradition, St. Finian travelled to Rome at some point, returning with a complete copy of St. Jerome’s (30th September) Vulgate. St. Finian reposed circa 589, and is one of the patron saints of the Province of Ulster, Ireland. FRITHESTAN, a disciple of St. Grimbald (8th July), St. Frithestan was consecrated Bishop of Winchester by St. Plegmund of Canterbury (2nd August) in 909. He served that See for twenty-three years and was known for his love of the poor and his prayers for the souls of the reposed. Shortly before his own repose in 932, St. Frithestan retired from his See, designating St. Birnstan (4th November) as his successor. 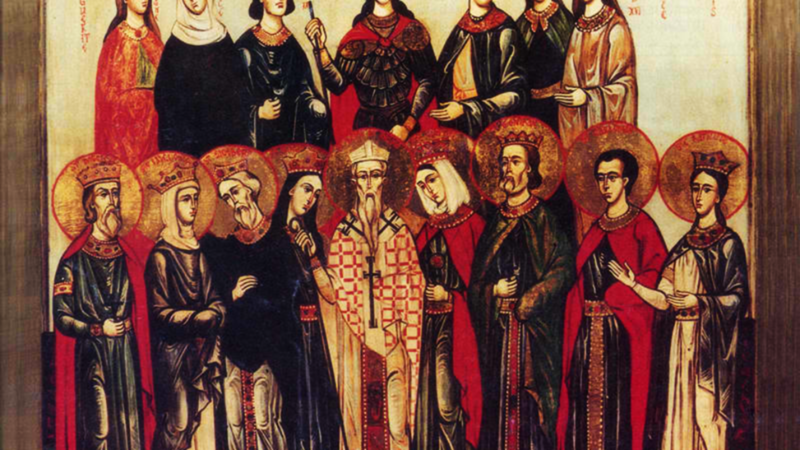 NEMESIAN, FELIX, LUCIUS, ANOTHER FELIX, LITTEUS, POLYANUS, VICTOR, JADER, and DATIVUS, nine bishops from Numidia (present-day Algeria), who, during the persecution under Valerian, were arrested, tortured, and finally martyred through slavery in the mines, circa 260. PETER MARTINEZ, also called St. Peter of Mozonzo, an Abbot of Saint Martin of Antealares in Compostela, Spain, who, circa 986, was consecrated Bishop of Iria Flavia (later the Archdiocese of Saintiago de Compostela). St. Peter reposed circa 1000. SALVIUS (SAUVE), (Sixth Century), a monk, then abbot, and finally the seventh Bishop of Albi in southern Gaul. Nothing further about St. Salvius’ life can be said with certainty, as there has been a conflating of details with that of two other people also named Salvius, who were more or less contemporaries. THEODARD, a disciple of St. Remaclus (3rd September) at the double monastery of Stavelot-Malmedy. St. Theodard succeeded St. Remaclus as Abbot and was later consecrated Bishop of Maastricht. Whilst traveling to meet with King Childeric II, St. Theodard was murdered, circa 670. VERANUS (VÉRAN), a son of St. Eucherius of Lyons (16th November), and for over forty years the sixth Bishop of Vence in Provence. St. Veranus reposed circa 480.